Introduction: Back pain is a common clinical problem and is the frequent complaint for referral of lumbar spine magnetic resonance imaging (MRI). Coronal short tau inversion recovery sequence (STIR) can provide diagnostically significant information in small percentage of patients. Materials and Methods: MRI examinations of a total of 350 patients were retrospectively included in the study. MR sequences were evaluated in two settings. One radiologist evaluated sagittal and axial images only, while another radiologist evaluated all sequences, including coronal STIR sequence. After recording the diagnoses, we compared the MRI findings in two subsets of patients to evaluate additional merit of coronal STIR imaging. Results: With addition of coronal STIR imaging, significant findings were observed in 24 subjects (6.8%). Twenty-one of these subjects were considered to be normal on other sequences and in three subjects diagnosis was changed with the addition of coronal STIR. Additional diagnoses on STIR included sacroiliitis, sacroiliac joint degenerative disease, sacral stress/insufficiency fracture/Looser's zones, muscular sprain and atypical appendicitis. Conclusion: Coronal STIR imaging can provide additional diagnoses in a small percentage of patients presenting for lumbar spine MRI for back pain. 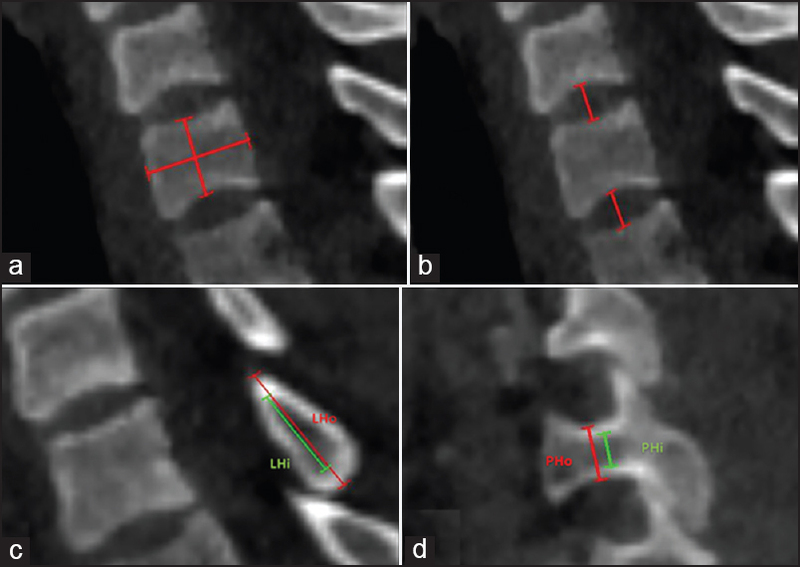 Therefore, it should be included in the routine protocol for MR imaging of lumbar spine. Introduction: Upper cervical injuries (UCI) have a wide range of radiological and clinical presentation due to the unique complex bony, ligamentous and vascular anatomy. We recently proposed a rational approach in an attempt to unify prior classification system and guide treatment. In this paper, we evaluate the clinical results of our algorithm for UCI treatment. Materials and Methods: A prospective cohort series of patients with UCI was performed. The primary outcome was the AIS. Surgical treatment was proposed based on our protocol: Ligamentous injuries (abnormal misalignment, facet perched or locked, increase atlanto-dens interval) were treated surgically. 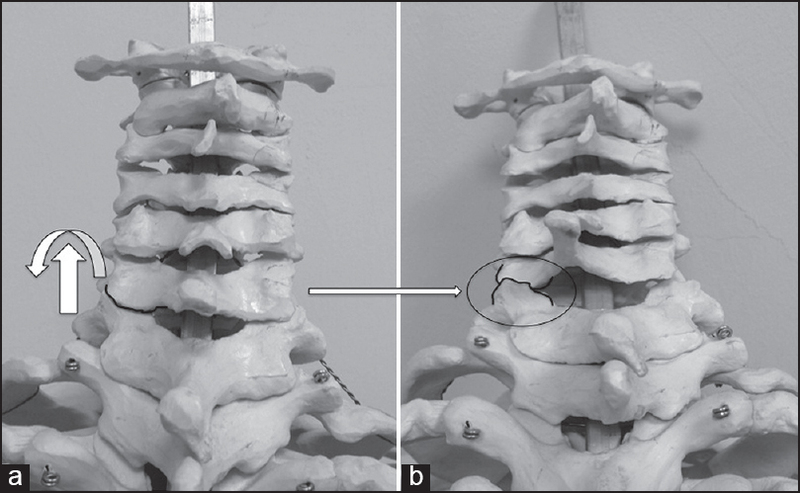 Bone fractures without ligamentous injuries were treated with a rigid cervical orthosis, with exception of fractures in the dens base with risk factors for non-union. Results: Twenty-three patients treated initially conservatively had some follow-up (mean of 171 days, range from 60 to 436 days). All of them were neurologically intact. None of the patients developed a new neurological deficit. Fifteen patients were initially surgically treated (mean of 140 days of follow-up, ranging from 60 to 270 days). In the surgical group, preoperatively, 11 (73.3%) patients were AIS E, 2 (13.3%) AIS C and 2 (13.3%) AIS D. At the final follow-up, the American Spine Injury Association (ASIA) score was: 13 (86.6%) AIS E and 2 (13.3%) AIS D. None of the patients had neurological worsening during the follow-up. Conclusions: This prospective cohort suggested that our UCI treatment algorithm can be safely used. Further prospective studies with longer follow-up are necessary to further establish its clinical validity and safety. Objective: To report a large clinical series of primary bone tumors of the spine (PBTS) and review the current concepts of management. 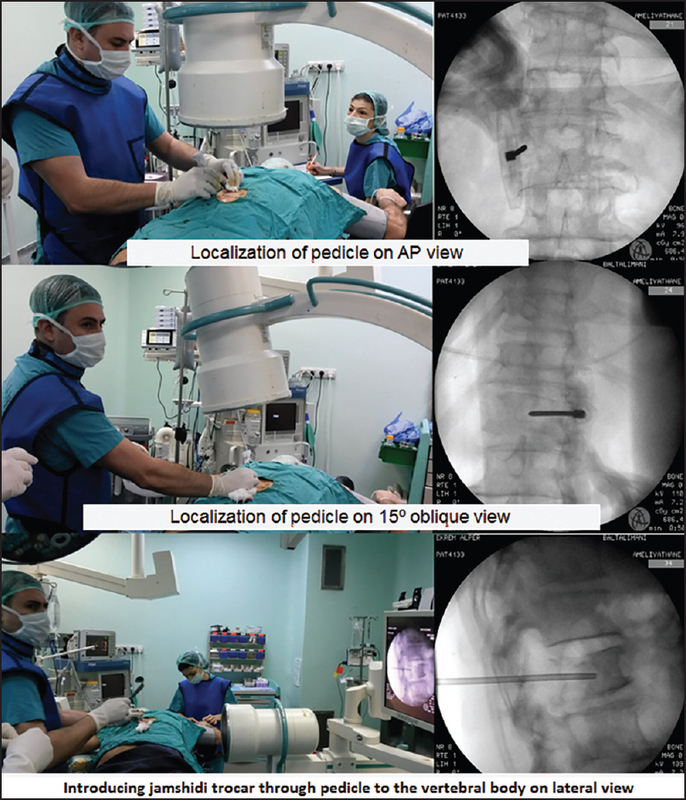 Materials and Methods: We retrospectively analyzed a clinical series of PBTS treated over the last decade (2004-2014) in the spine unit of a large European tertiary care center. Every PBTS was identified from an electronic medical-record system. Analysis comprised medical records and clinical imaging. Overall survival and outcome was measured using the Glasgow Outcome Scale (GOS) at six weeks, six months and one year postoperatively. Surgical management and adjuvant/neoadjuvant strategies were analyzed. A thorough review of the current literature was performed. Results: A total of 79 patients were included. Of these, 44 (55.7%) were male. The age ranged from 9 to 90 years (mean 55), and most patients were adults (93.6%). Local pain was the most common symptom and was present in 91.1% of the patients. The majority of the tumors occurred in the thoracic spine (52 patients, 65.8%). Overall 86% (68 patients) of PBTS were classified as malignant and at the time of diagnosis, 7 patients (8.9%) presented with non-spinal metastasis. The most common histologic types were hematopoietic tumors (72.2%), followed by chondrogenic ones (12.7%). Within hematopoietic tumors, plasmacytoma was the most frequent type (49 patients, 62%). In 12 patients (15.2%) recurrences were seen during the follow-up period. Overall mean survival of benign PBTS was 100%, malignant non-hematopoietic PBTS 50% and, malignant hematopoietic PBTS 84% at one year, respectively. At six weeks and one year after the initial surgery, 79% and 54% of the patients presented a GOS >3, respectively. Conclusion: PBTS were almost exclusively seen in adults. Malignant tumors were markedly more frequent than benign tumors, with hematopoietic tumors being the most common type. For PBTS, early surgery is important in order to restore spinal stability and decompress the spinal cord. This allows pain reduction and prevention of neurological deficits. Context: This study was designed to understand and define the special radio-anatomic morphometry of C7 vertebra by using multidetector computed tomography (MDCT). Aims: The major aim of the study was to detect the gender- and side-related morphometric differences of C7 vertebra among subjects. Setting and design: Our radiology unit database scanned for MDCT sections of the C7 vertebra. Materials and Methods: A total of 214 patients (134 men, 80 women) were selected. A detailed morphometric evaluation of C7 was done. Statistical analysis used: T test, ANOVA. Lamina length (P < 0.001), pedicle length (P < 0.001), outer cortical (P = 0.01) and inner cancellous pedicle (P < 0.001) width, pedicle angle to sagittal plane (P < 0.001) values were statistically significantly different on the right versus left side. When the results were stratified by gender, lamina length, inner cancellous lamina height, pedicle length, inner cancellous pedicle height, outer cortical pedicle width, lateral mass anteroposterior length, anteroposterior length of C7 corpus, height of C7 corpus (P < 0.001), C6-7 (P = 0.013) and C7-T1disc height (P = 0.04), transverse foramina perpendicular width at C7 (P = 0.046) values were found to be statistically significantly different. Vertebral artery most commonly enters into the transverse foramina at C6 level. Conclusions: Gender and side differences are important factors for preoperative planning and showed significant differences among subjects. MDCT is a practical option for investigating the exact anatomical features of osseous structures. 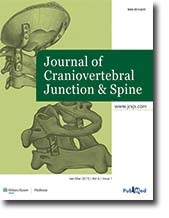 Aim: The purpose of this article is to compare the similarity of initial radiological diagnosis and pathological diagnosis between thoracal and lumbar vertebral bodies and the adequacy and the reliability of open and percutaneous biopsies performed via transpedicular approach in the lesions located in vertebral bodies. 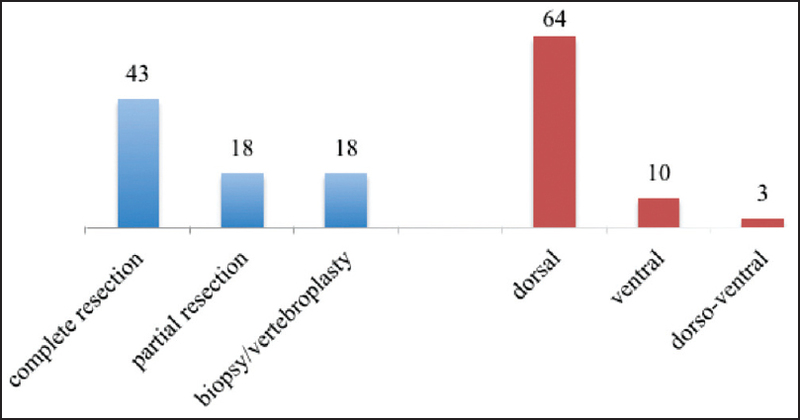 Materials and Methods: Thirty-three patients who had undergone transpedicular biopsy for vertebral body lesions were retrospectively evaluated. Seventeen patients were diagnosed by percutaneous transpedicular biopsy (11 in the lumbar vertebrae, 6 in the thoracal vertebrae). Sixteen patients were diagnosed by open transpedicular biopsy (9 in the lumbar vertebrae, 7 in the thoracal vertebrae). Results: The similarity ratio between the initial radiological diagnosis and the final pathological diagnosis was 71.4% in the open biopsy and was 69.2% in the percutaneous biopsy (P > 0.05). 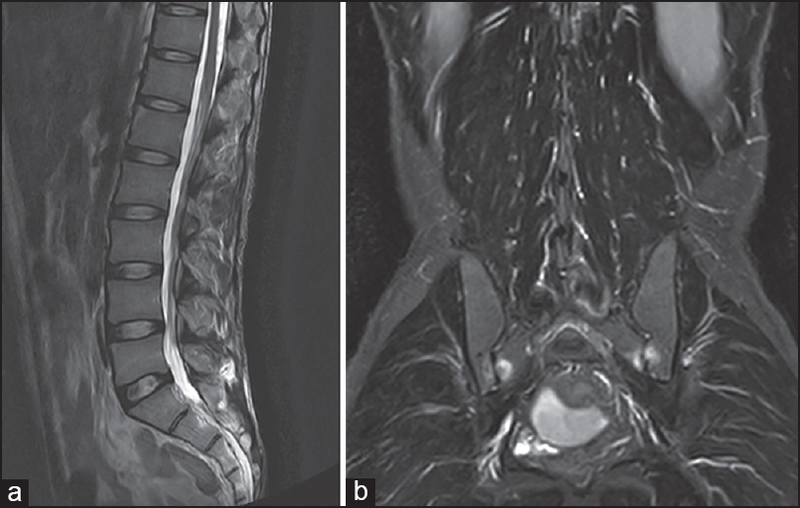 The similarity ratio between the initial radiological diagnosis and the final pathological diagnosis was 66.7% in the lumbar region and was 77.8% in the thoracal region (P > 0.05). For percutaneous biopsy group, the similarity ratio was 72.7% in the lumbar region and was 66.7% in the thoracal region (P > 0.05). For open biopsy group, the similarity ratio was 62.5% in the lumbar region and 83.3% in the thoracal region (P > 0.05). No complication was observed. Conclusion: Specimen adequacy of open biopsy was higher than percutaneous biopsy. Particularly, the open thoracal biopsy has provided the highest similarity ratio between the initial radiological diagnosis and the final pathological diagnosis. Congenital anomalies of the craniovertebral junction (CVJ) are complex developmental defects. 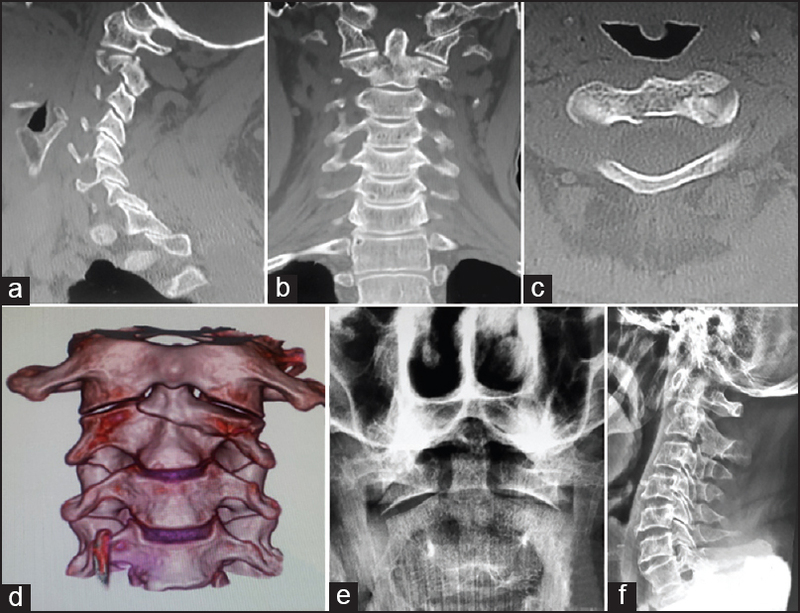 We describe a patient with atlantoaxial dislocation (AAD) and short stature whose morphopathologydid not fit into any of the previously described syndromic constellations. The patient underwent a reduction of the AAD followed by fixation with C1-C2 transarticular screws. Although numerous syndromes have been linked to both dwarfism and craniovertebral junction anomalies, this patient did not fit into any of these patterns. It is possible that this may be one of the many as yet unrecognized patterns of congenital anomalies. Most of the cervical spine injuries in the pediatric population are typically seen in the upper cervical region. Unilateral cervical facet dislocation (UFD) in subaxial region is a rare injury in pediatric population. In this paper, a rare case of delayed locked UFD in a 9-year-old boy with rare injury mechanism treated surgically is reported. Clinical and radiological findings were described. 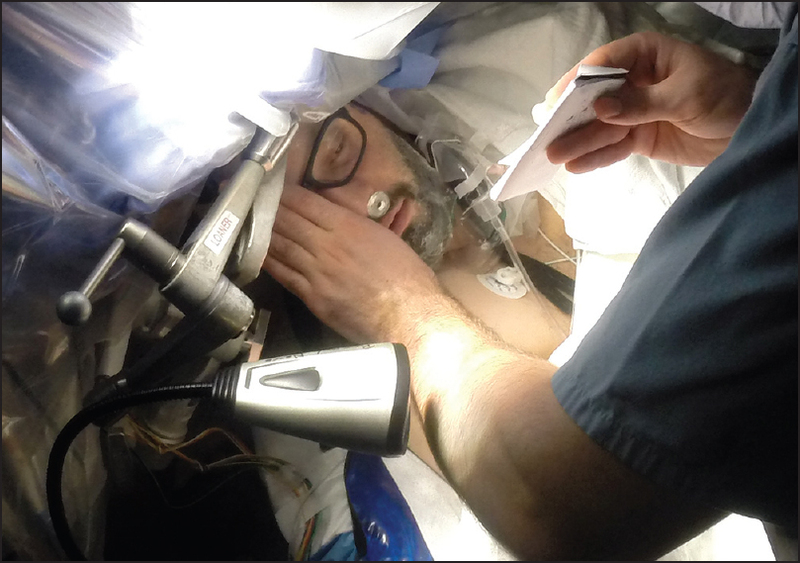 The patient with C6-7 UFD without neurologic deficit was underwent open reduction and internal fixation via anterior and posterior combined approaches. Significant improvement of pain and free motion in cervical spine was obtained. There was no complication during the follow up. Only three case reports presented about the lower cervical spine injury with UFD under the age of 10 were found in the literature.